The objective of the global Roll Back Malaria initiative was to reduce the malaria burden by half in 2010 compared with 2000 (1). Epidemiology of malaria varies considerably and depends on the biology of the vectors, the parasites and the human hosts and also socio-economic factors. On the other hand, the main technical interventions for control of malaria used in a specific region are based on prompt and effective treatment of malaria cases, prevention of malaria by reducing exposure to infective mosquito bites, prevention of malaria through chemotherapeutic measures, and prevention and control of malaria epidemics. Prompt and accurate diagnosis of malaria is the important key for disease management and also reduction of unnecessary use of anti-malarial medicines (2). In addition, drug selection for treatment of malaria depends on species of malaria parasite present in suspected patients. The standard method for detecting Plasmodium infection is the microscopic examination of Giemsa-stained thick blood smear. Although effective and inexpensive, this method is laborious and time-consuming, and its sensitivity drops with the decrease of parasitaemia (3,4) and mixed infections (4,5). Further, most microscopists on finding of one species might not look for a rare second species in the smear (6). However, molecular techniques have been able to detect and identify malaria parasites in mixed and low level parasitaemia (7). Different studies conducted in Africa (8), South-East Asia (4,9-11), Venezuela (2) and Iran (12) have revealed high prevalence of mixed parasites infections by PCR assay, that could not be detected by blood thick smear indicating the usefullness of molecular techniques for decision making in disease control and treatment (4,13,14). We designed this investigation to re-assess malaria diagnosis using sensitive nested-PCR techniques and also measure the frequency of P vivax and P. falciparum mixed infections in three malaria endemic countries in the Middle East: Afghanistan, Iran and Pakistan. 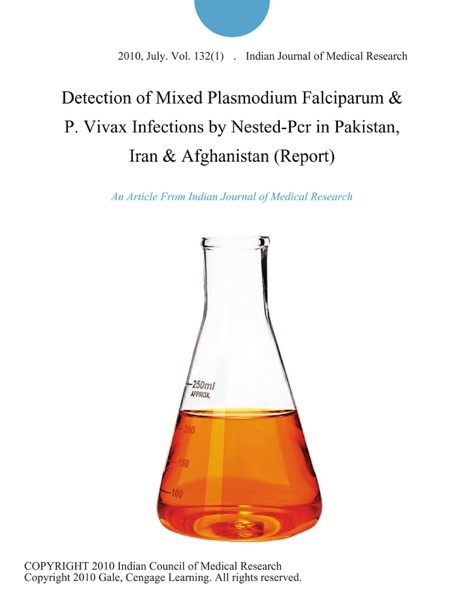 Afghanistan, Detection, Falciparum, Infections, Iran, Mixed, NestedPcr, Pakistan, Plasmodium, Report, Vivax permalink.